Solar water heating (SWH) is the solar thermal heat technology for “converting solar energy into thermal energy to heat up water.” It is considered a low temperature technology, with ranges up to 80°C for residential applications and 250°C for industrial applications. SWH dates back to years ago, where the first patented product appeared in the United States in 1896. Since then, the technology has witnessed major developments. By the 20th century, solar water heaters emerged as a feasible alternative for fossil-fueled heaters. The energy conversion follows the rules of thermodynamics and heat exchange like any other conventional water heating system. However, since the main energy input –the sun – is variable, the factors affecting the efficiency of solar water heaters are more complex. This system is different from a solar panel (also known as Photovoltaic (PV) cell), which utilizes the sun's energy to generate electricity. SWH systems are passive (i.e. utilizing natural circulation of the heat fluid; e.g. thermosiphon systems) or active systems (i.e. utilizing forced circulation; e.g. systems with a circulating pump). The system can also have an open loop or a closed loop layout. The closed loop is more advantageous, since the heat fluid in the separate heat exchange cycle can be either water or a mixture of water and glycols, the latter used in cold climates to resist freezing. 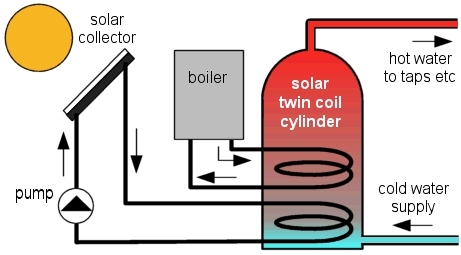 Passive solar water heating system with open loop layout. By Quality First Home Improvement, Inc. 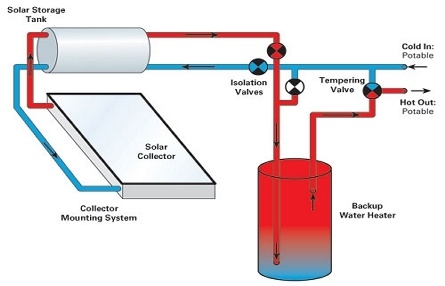 The main component of a solar water heating system is the solar collector, which is mainly responsible for “collecting” the sunlight and conveying it to the heat fluid. Collectors are either flat plate collectors (FPC) or evacuated tubes collectors (ETC). ETCs have proven better efficiencies than FPCs, while FPCs are usually cheaper and easier to manufacture locally.